Are you interested or is someone you know interested in learning more about what it takes to become Catholic? Come ask your initial questions about the Catholic Church and the RCIA formation process. 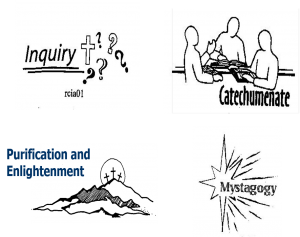 St. Joseph&apos;s Inquiry Nights are a lot of fun and very informative, For more information, contact Susan/Jack Burke at 636-861-2075 or Marianne/Vince Burkemper at 636-346-3717. The RCIC (Rite of Christian Initiation of Children) is a related program that prepares young people (grade school through high school) for reception into the Church. Call the parish office for more information.